For most of us, traditional roguelikes are intrinsically inaccessible. They’re notoriously difficult, their design is complicated and often opaque, they can have more hotkeys than there are keys on the keyboard, and their ASCII-based visuals mean that it’s often unclear what’s happening on the screen. It’s these exact qualities, however, that ironically make roguelikes accessible and even appealing to blind or low-sight players. Brogue was created by one person. Rogue was created by two. Dwarf Fortress? Two people. Caves of Qud – three people. Desktop Dungeons: five. Dungeon Crawl Stone Soup has had two hundred and fifty three contributors. Of these, fifty have been core developers. In the sixteen-year history of Dungeon Crawl Stone Soup, there has never been a lead. No design lead, no engineering lead, no art lead, no producer. In the cracked, yellow high school assembly hall, a fresh corpse hangs upside down above the stage. Below him are dozens of lit red candles, and to either side are banners of government propaganda. You drag a box cutter across his throat and use a bowl to catch the blood. You will offer the blood to thirsty gods, and ask them for protection. Go to the official forum for any multiplayer game and you’ll find dozens of threads debating which characters, items, or strategies are overpowered. “Why are druids so OP?” asks a poster on the World of Warcraft forum. “FKING OP Riot pls fix the problem with yasuo is so fcking op,” adds a fine contributor on the League of Legends forum. “AWP Overpowered,” says a CS:GO player. First and foremost, Kona is about its mystery. If you want to feel the frozen air of northern Canada blowing through your screen, go play The Long Dark. But if you want to smoke a cold cigarette every time you see something freaky, Kona’s got your back. I come to Legends with a different perspective on the genre than the average player. I was the lead designer on a similar digital card game for six months (it never shipped). Legends grapples with many of the same design problems that I’ve thought about for hundreds of hours. Some of their solutions to these problems are novel and successful, while other are not. 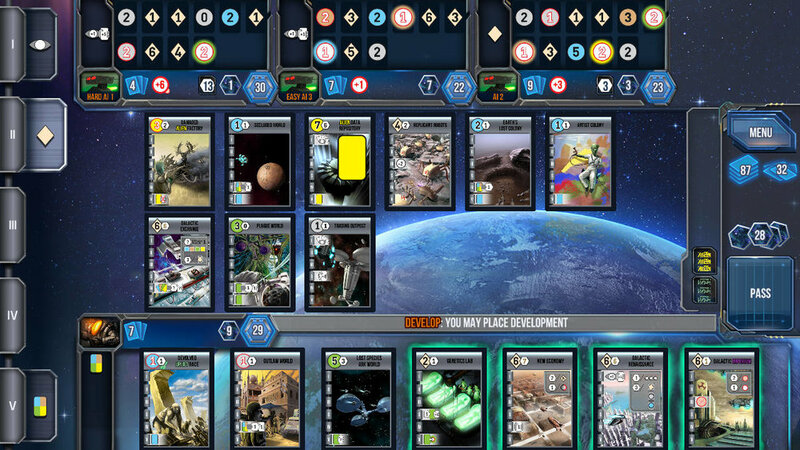 The groundbreaking 2007 card game Race for the Galaxy has made its way to Steam. In it, 2-4 players place cards in front of them and discard cards in their hand to settle planets (peacefully or by force), develop new infrastructure, build a trade engine, and pursue one of many paths to victory. Race for the Galaxy is part of the board game canon, and it’s one of the most popular board games in the world. The Signal from Tölva is an open-world shooter set on a ruined planet. You are a robot brain who jumps between robot chassis to wander through a pretty landscape shooting other, hostile robots, and you’ve come to Tölva to investigate the mysterious messages that a dispatcher called The Broker has intercepted. I enjoy pretty landscapes, mysteries, and robots, so I expected to enjoy The Signal from Tölva, but I was disappointed to find a repetitive, empty, and frustrating six to ten-hour slog. A while ago my sagely cat Xyzzy gave many pieces of advice to wisdom-seekers on Twitter. She personally read through their Twitter feeds and then tailored her advice accordingly. That advice is preserved here for posterity.